On Monday 26th February a convention is held at Annone Veneto (Venezia). 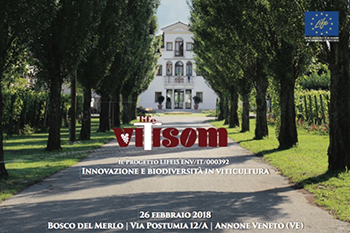 The title is innovation and biodiversity in viticulture, organized within the project Life Vitisom. The meeting starts at 9 am and the venue is the winery Bosco del Merlo in via Postumia, 12/A. The speakers are I. Ghiglieno, V. Boatto, A. Pitacco, N. Vendrame, L. Tezza, P. Dosso, G. Arata.